AB de Villiers is the Player of the Match for his unbeaten 59! ABD: We've waited a long time this season, so we're very happy! I've got too much respect for the game to be upset about it. I just haven't crossed the line on a few occasions. I know you're always just one knock away from getting into the confidence zone. I've decided not to play international cricket to keep myself sharp for other forms. Playing 11 months of cricket, I cannot stay sharp. It was a fantastic move to get Dale. One thing's for sure, you'll get 200 percent from him. Another great human being in our team. We have to win a lot of games now. Hopefully more successes around the corner for us. RCB beat KXIP by eight wickets! RCB clinch their first win of the season! Stoinis smokes the first ball off Sarfaraz for a four and then takes a double to lead RCB to win. The whole of Bengaluru is going to party harder tonight as RCB finally get off the mark in IPL 2019. It has taken them seven games but today they were the better side in all departments. Despite Gayle's unbeaten 99, some great disciplined bowling in middle-overs never allowed KXIP to get way with the bat. Virat Kohli and AB de Villiers then put up another classic batting performance as they clinched the match by eight wickets! That's all for tonight! Two more matches coming up tomorrow. 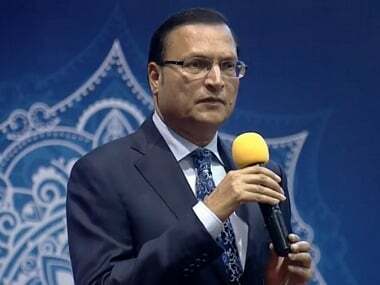 KKR take on CSK while SRH face DC. Our live blog for the first match starts at 2.30 PM. See you tomorrow. Good night! Virat Kohli, winning captain: Most pleasing thing is coming for an interview at this time, and not immediately after the match gets over. I won't say we have been unlucky in every game, but a couple of games we should've closed out before this. We thought 190 will be par but to restrict them to 170 was a great effort. To pick up 4 wickets in 8 overs in the middle for 60 runs was a great effort. Marcus Stoinis: I thought I was pretty comfortable here (At Mohali). (On ABD) Probably the best player of our generation. I think the main difference for us tonight how we came back with the ball, and then the big partnerships with the bat. We'll make sure we're having fun, and we'll start thinking about it if it gets close towards the end. 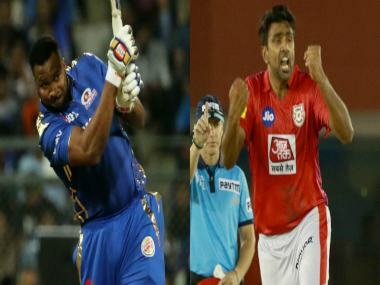 Ravichandran Ashwin, KXIP captain: There's only six runs to go, and the ball was sliding in nicely, and with AB and Stoinis, I thought a leggie had a better chance. I thought we let ourselves down on the field. All these small things make a difference in the end. To be completely honest, the dew helped batting. Gets better to bat in the second half. I had to back my best bowlers, and it didn't work out today. We have a few more games at home, and hope they turn up in big numbers then as well. Shami started off well but gave two boundaries at end. A four to Stoinis and then a six over fine leg for ABD. 6 needed in 6 balls. Andrew Tye has conceded 35-plus runs in each of the four IPL matches this year. Quite an eventful over. 18 off it. 20 needed in 12 now. Stoinis whipped the full ball to mid-wicket fence before cutting the length ball past point for another four. His pull shot went up in air but Murugan put it down in deep before ABD slapped the wide ball from Tye over cover for a six. He also completed his fifty with a single. Excellent bowling from skipper Ashwin! Gave very little room for the batsmen to free their hands. Six off the over. He finishes with bowling figures of 1/30. 38 in 18 required. Kohli’s gone, but it’s still RCB’s match to lose. 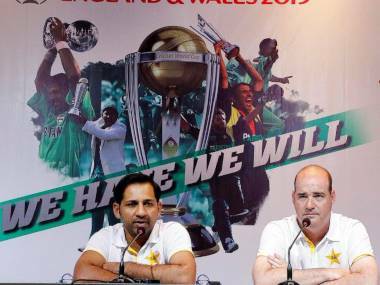 At this stage, 10 runs or so an over as crucial as wickets in hand. Importantly, one of these happens to be @ABdeVilliers17 ! Kohli and ABD were looking in cruise control but Shami has got a wicket here! Kohli found the mid-wicket fielder straight with his pull shot off short ball. Stoinis is out to bat. 44 needed in 4 overs. Virat Kohli and AB de Villiers now hold the record of adding most runs as a pair in IPL, going past 2787 runs added by Chris Gayle and Virat Kohli. A push to long-on by ABD for a single followed by a shot to cover by Kohli for another single. ABD plays the googly straight down the ground for one and Kohli takes one more. 48 needed in five overs. ABD tucks the first ball to mid-wicket for a double. Three more singles added. Five off the over. 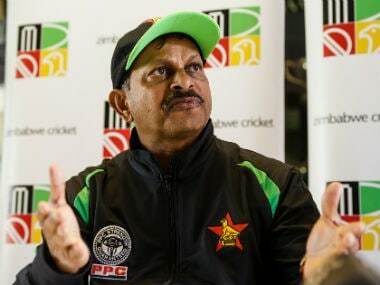 52 needed in six overs. Kohli takes a double with a flick to mid-wicket followed by three singles. ABD scoops the slower ball from Curran over short fine leg for a boundary and then takes one more single. 10 off the over. 57 needed in 42 balls. Kohli gets another boundary as he tucks the leg side ball to square leg.There was also chance of a run-out as ABD ran back to non-striker's end for a double but Tye failed to collect the ball. Nine off the over. Fifty up for Kohli! He reached there in 37 balls. RCB need 76 in nine overs. He also got a four off the over as he rocked back to cut the slower ball from Ashwin past point as a lazy Shami was too slow to bend down. Four off first ball! ABD played the drive wide of long-off. Rahul came running and put in a slide but missed the ball as it ran down to the fence. Followed by a single. A double for Kohli with a push to long-on. One more single. Eight off the over. Virat Kohli now holds the record of scoring most runs by an Indian in T20s, eclipsing Raina's tally of 8145 runs. Skipper Ashwin comes back into attack! Six off the over with six singles. Kohli is on 40 and RCB need 94 in remaining 11 overs. Time for strategic time-out. Excellent over by Murugan Ashwin! Just three runs from it! More of spin bowling required on this strip to keep these guys quiet. Ashwin has called Andrew Tye into attack! Dot ball and then two singles. A double for ABD with a flick and then a hard slap off last ball, which was short, over cover for a one bounce four. Eight off the over. Murugan Ashwin started well even forcing Kohli to inside edge one though it didn't hit the stumps but he lost his rhythm a bit as he presented him with short deliveries. Kohli cut the first one past point to get a four on off and then clipped the next one to mid-wicket fence. Nine off the over. Powerplay up! ABD has come out to join Kohli and he never takes too long to get into the groove! Plays a beautiful back-foot punch off length ball to beat the mid-off fielder and then opens the face of the bat late against good length ball to pierce the third man fence off Shami. 10 off the over. 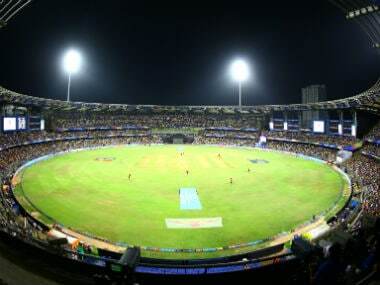 IPL 12 Match 28 KXIP vs RCB at Punjab Cricket Association IS Bindra Stadium in Mohali: RCB beat KXIP by eight wickets! RCB clinch their first win of the season! Stoinis smokes the first ball off Sarfaraz for a four and then takes a double to lead RCB to win. IPL 2019, KXIP vs RCB, Today's Match Preview: Kings XI Punjab face Royal Challengers Bangalore in the 28th match of the Indian Premier League 2019. 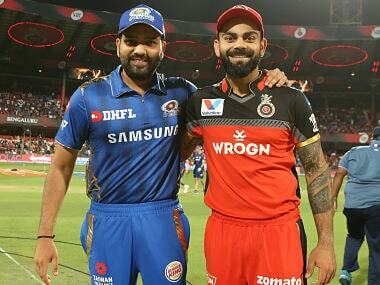 Still searching for their first win this season, Virat Kohli's men find challenges stacked against them, but playing after a small break the Royal Challengers Bangalore (RCB) will be rejuvenated to make a mark against R Ashwin-led Kings XI Punjab (KXIP). RCB will find some solace in the fact that KXIP have been slightly off the boil in few off their games. Couple of nights ago the Punjab franchise lost from a winning position against the Mumbai Indians, where Kieron Pollard bludgeoned 83 off 31 balls dishing out some severe beating for Kings XI bowlers. RCB have been woeful in all three department and even any mathematical possibility off making the top four is quickly diminishing. The Kings XI will look to extend their good run at Mohali, having won all their three games so far and will be aiming for another win against the bottom-placed Bangalore side in their bid to remain among the top four. Kings XI openers KL Rahul and Chris Gayle have been in tremendous form and once again the onus will be on the attacking duo to help the Kings XI middle order that has few weaknesses. 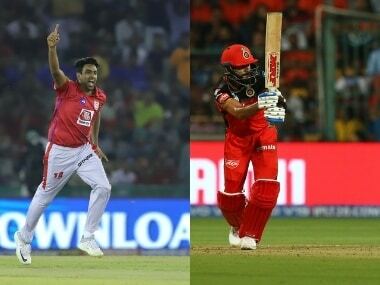 Kings XI Punjab (KXIP) Team 2019 Players list: KL Rahul (wk), Chris Gayle, Mayank Agarwal, Sarfaraz Khan, David Miller, Mandeep Singh, Sam Curran, Ravichandran Ashwin(c), Andrew Tye, Murugan Ashwin, Mohammed Shami, Mujeeb Ur Rehman, Karun Nair, Moises Henriques, Varun Chakravarthy, Harpreet Brar, Simran Singh, Nicholas Pooran (wk), Hardus Viljoen, Ankit Rajpoot, Arshdeep Singh, Darshan Nalkande, Agnivesh Ayachi. Royal Challengers Bangalore (RCB) Team 2019 Players list: Virat Kohli (c), Parthiv Patel, AB de Villiers, Colin de Grandhomme, Umesh Yadav, Yuzvendra Chahal, Moeen Ali, Shimron Hetmyer, Shivam Dube, Mohammed Siraj, Navdeep Saini, Devdutt Padikkal, Himmat Singh, Milind Kumar, Gurkeerat Singh Mann, Heinrich Klaasen, Pawan Negi, Washington Sundar, Akshdeep Nath, Prayas Barman, Kulwant Khejroliya, Tim Southee, Marcus Stoinis, Dale Steyn.